Hot. Humid. Painful. Yet I still can’t wait to run another 10K. I have so much respect for 10Kers. It’s such a painful distance. Long enough to be distance, short enough to be a sprint. It’s like the 800 of distance running. I’m eager to master the art of the 10K. I’ll make this short and sweet because I have 10,000 things to do before school tomorrow morning, but in the spirit of balance, I’m gonna take some time to reflect on this race. The Santa Monica Classic is back after a year hiatus. I’ve never run it before, and thought it would be a good speed test before the New York Marathon. I’d been dealing with some stomach issues all week, so I was nervous about the race. Not because of performance, but because I didn’t want my stomach to be the reason I failed. An overload of probiotics and a diet of mostly white carbs on Saturday set me up for a decent race on Sunday. I worked HARD on Sunday. Don’t be fooled by the smile. At mile 3 while dumping water on my head I seriously questioned my decision to sign up for this race. During mile 4 as I was running uphill, struggling to run under a 7 minute pace, I knew signing up was a mistake. Miles 5 and 6 I managed a 6:31 and a 6:23 and just kept my sight on the finish line. I wanted to quit. When I crossed the finish line I was super annoyed because I thought I was 4th female overall, but later learning that starting a little further back in the corral meant I was the 2nd place woman out of 700ish, only beat by Bria Wetsch. I’m OK with that, but still annoyed that my pace was the same as a half marathon pace. My legs just didn’t want to move faster. I’ll blame that on the heat and lack of any form of tapering 🙂 Ellen was the 10th woman to cross the finish line, and Marta was on pace to finish top ten, but stopped for a friend and still managed 14th. Out of 700 women. Amazing! Marta also had NO PAIN after a few weeks of dealing with some ITBS issues. She’s all ready for Chicago in a few weeks! Keep foam rolling like a crazy woman. The Three Amigos celebrated with Gjusta and pool time. During this whole dealio, Brent was off running 20 miles. Lots of post-race snacks. LOTS! Like enough for me to take some as extra snacks for school. I personally liked the course. The uphill portion sucked, but I love running on Ocean Avenue and on Main Street. Timing issues at the end. 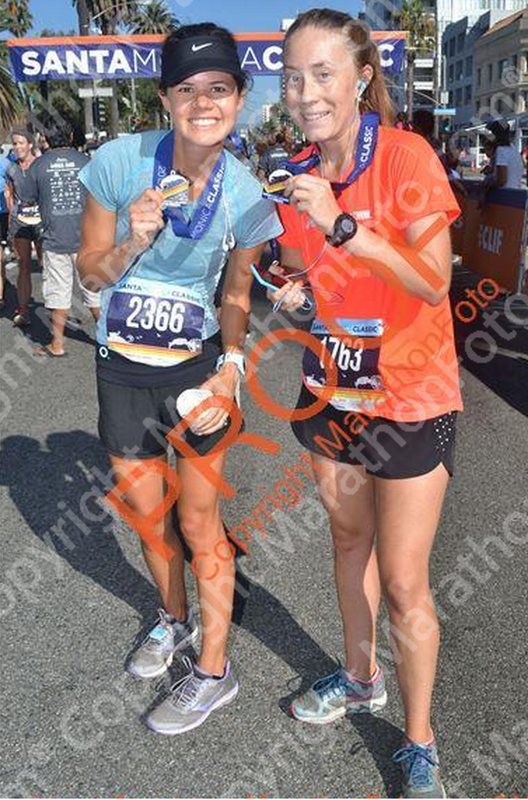 My official time was 15 seconds off my garmin time. Did I mention I was sweating before I even started? Maybe an earlier start time next year? OK. Back to work. Have a happy work week! 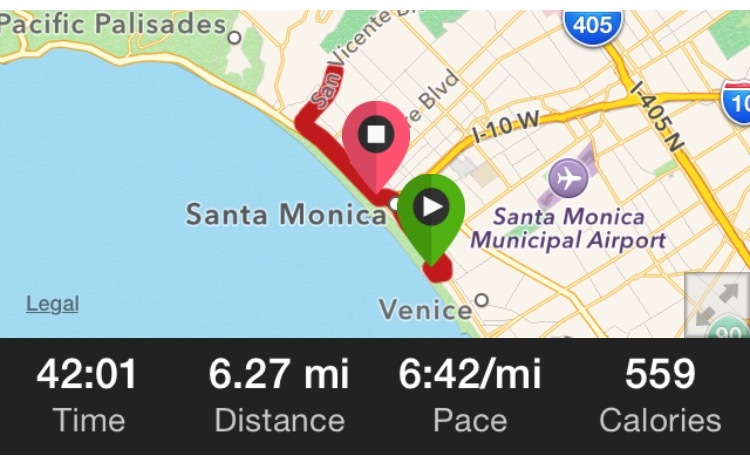 This entry was posted in Race Review and tagged gjusta, santa monica classic. Bookmark the permalink. ← Equitas Academy #3 is Up and Running! Congratulations on 2nd place!!! Holy cow! OH SO REFRESHING to hear that even the Great Cristina struggled on this one. That was my worst race ever and the first time I ever wanted to quit a race. I had some kind of an asthma/panic kind of episode in mile 2 and just could not seem to recover from it. Amen to an earlier start time!